The last time we checked in on the momentum of Mark Ronson's "Uptown Funk! "—in June of the year 2015—the RCA megahit had made its way to #30 among the bestselling singles of all time, having moved more than 6.1m. 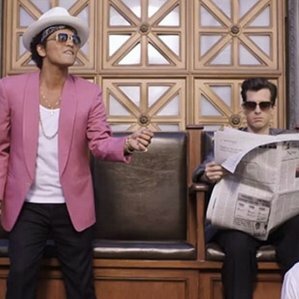 Since then, the barnstorming jam (fronted by the redoubtable Bruno Mars) has reached #17 with just over 6.9m sold. In between these milestones, "Uptown" garnered a fistful of Grammy nods, including Record of the Year and Pop Duo/Group Performance, while Ronson's full-length, Uptown Special, is a contender for Pop Vocal Album. A performance on the 2/15 telecast would certainly help spike the song still further. At 7.04m+, Ronson will overtake Katy Perry's "Firework" for #15; at 7.3m he'll hit the Top 10 (surpassing Flo Rida's "Low"); 7.95m would give him Top 5 (displacing "Radioactive' by Imagine Dragons). To beat the all-time champ, Black Eyed Peas' "I Gotta Feeling," Ronson and crew will have to top 8.77m. Our money's on the "Funk" hitting Top 3 for sure. After that, we'll see. In the meantime, check out our Grammy-centric Q&A with Ronson here. And just because it's wonderful, here's a brilliant video mash-up of "Funk" with about a gazillion clips from classic musicals. The montage first appeared online in October and has garnered 15m+ views.